Lambda is our new flagship sequencer, it was designed to be the perfect device for dance producers. It has two independent sequencers : one is for notes and note lengths, the other one is for velocity and note delay. You can set the the length, division, interval and direction of them separately. With Lambda, you can create simple, repetitive synth loops, basslines or interesting random-like sequences, it all depends on you. The AC Encoder device converts the incoming MIDI data (note and velocity) into CV and Gate (or Trigger). From version v2.o2 it is multichannel! As an alternative, you can build your own, check the downloadable instructions below. ﻿Download the build instructions for the hardware. Root is an adjustable master clock generator. You can change the curve and the length of the generated trigger. There are also adjustable delay and swing controls for both clock generators. With Macro, you can assign MIDI CCs to Live macros. You automate the parameters, change the name of your controlled device and the selected parameters. Polyrandom featured in the 25/10/2016 Cycling '74 newsletter. Thanks to Darwin Grosse for the support! OctoTrig is an 8 (multi)channel AC encoded MIDI to trigger converter, a really helpful addition to Polyrandom. Bricks is a 16 locations cartesian sequencer, highly influenced by René, from MakeNoise, with a huge west coast impact. Bricks is about experimenting and exploring new patterns, new sequences and new melodies. It is available for every Yakuza owners as a free upgrade. Turing Machine featured in the 2017 March issue of Estrada i Studio. Great article from Marcin Staniszewski, thank you very much for the support! Diceq is a dice roll based random drum sequencer. In every clock event, you roll a virtual dice, where you can set the probability for each number and these are assigned to MIDI notes. 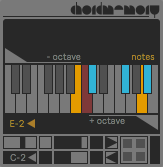 Time is a 4 note drum / percussion sequencer, influenced by watches. MIDI notes are triggered at every second, then every minute, every hour and at 12 o'clock. You can control the density of the triggers and you can also "warp" by the time, by reducing the amount of seconds, minutes and hours. Binary is a new kind of drum sequencer, where the steps are determined by the selected binary numbers in the grid. It is a real geek/nerd device, designed for experimental people. I, like many others, started making music with trackers. I used Impulse Tracker, back in '97-'98. ATC is a really simple device, it is like KR, but this time, with audio. You can just drop into an audio channel and it will convert your audio into control, what you can then map into anything in Live. Or, you can choose the trigger mode, where ATC generates random control messages if there is an incoming audio peak. These devices are designed to control external hardware instruments from Live, automate the front panel controls, give you access to some hidden controls. ​Also, they give you extra features, like velocity control, randomisation, preset save/re-call. The package includes all of the control panels and future control panels will be included in the update. ​Please note, these devices does not produce sound, they are for controlling external hardware! Control panel for the Roland Boutique TR-09 Rhythm Composer. Besides the front panel controls, there are mute/solo buttons for every instrument and also, you can control the hidden parameters, like decay and tune for some instruments. Also, you can randomise every parameter, per instrument or globally. Control panel for the Korg Volca Beats drum machine. Besides the front panel controls, there are mute/solo buttons for every instrument and also, you can control the hidden parameters, like pitch for some instruments. The missing velocity is also implemented. Control panel for the DSPSynth DSP-G1 analogue modelling synthesizer chip. All controls from the user manual is available, could be automated and saved with the Live set. Also, you can randomise or reset every parameter. 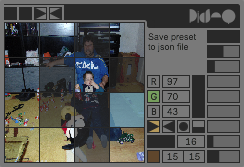 Presets can be saved into .json files for later use. This control panel has all the available MIDI CC controls for the Korg Volca FM, like Transpose, Velocity, Modulator Attack and Decay, Carrier Attack and Decay, LFO controls, Algorithm selection and ARP controls. ​Of course, Velocity hack is implemented. Presets can be saved into .json files for later use, but, please note, presets will containe only the editor state, won't save the sysex patch! We buy our hardwares at Muziker or Thomann! Worldwide shipping, great prices and amazing customer service!